Every summer, on a town in the very northwestern corner of Connecticut -- a community of roughly 1,700 people, a farmer's market and some acclaimed Berkshire hiking trails -- a rough-hewn group of artists descend. During the six-week course, instructors of Yale's Art and Music School in Norfolk polish their charges into refined visionaries -- the next Chuck Close or Kehinde Wiley. In 1998, Elizabeth Livingston, at the time a Yale undergraduate, arrived ready for the rigor -- and found herself working at night, under a pale streetlamp, painting the dark, isolated clapboard houses surrounding the town. "I would look at the houses in the dark and wonder how can something be so beautiful and precious and detached and terrifying at the same time, and moreover, how would I reconcile these aspects in my painting?" Livingston said recently in her DUMBO studio. "A professor who, at first, called my work garbage came around and said 'I think you're on to something, here'." For the next 15 years, Livingston worked at resolving the contrasts in her photorealistic paintings -- mostly portraits of her friends, sister and self in detached or solitary moments -- and showed at galleries all over New England. 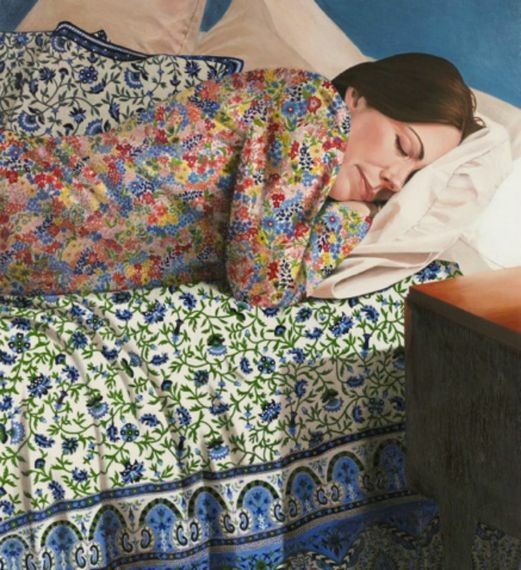 This month, however, she exhibits the isolation and solitude -- the anxiety and the allure -- of modern life's continuum at the Lodge Gallery in Manhattan's Lower East Side. Entitled Night Fell, after one of her pieces, it is the artist's first solo New York show. "Liz takes great pleasure in peeling back veneers of suburban order to capture intimate moments," said Jason Patrick Voegele, one of the founders of the Lodge Gallery and the instigator of the show. "Her most recent body of work evokes all the same cinematic emphasis on visual scrutiny and moments of false security -- much like a Hitchcock or Vermeer." "There is a shared suspense in these voyeuristic moments, a sense of the quiet before the storm or the last rays of light before night arrives." 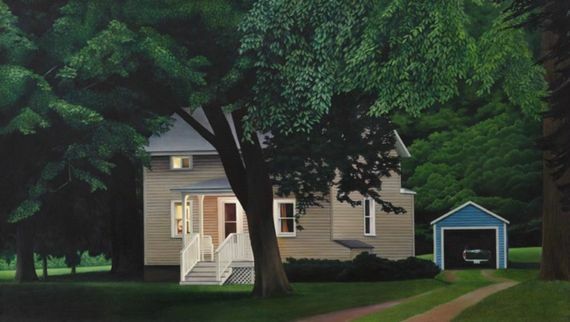 As one of her influences, Edward Hopper, Livingston has been called a realist, but her works manifest the ways in which memory infuses her surroundings: mostly the material memorial of suburban Connecticut, just outside New York City. Hopper told the Smithsonian Institution in 1959 that his "aim in painting has always been the most exact transcription possible of my most intimate impressions of nature." So is Livingston's. Raised "solidly middle class" in New Canaan, Connecticut -- a city with one of the highest GDPs in the country -- Livingston witnessed the "whole Stepford Wives thing" or "how something could appear so charming and so perfect, yet underneath have such a darkness and a vulnerability." Livingston deeply felt the loneliness, guardedness and illusion of community in her youth and at Yale began to paint figures that expressed it. 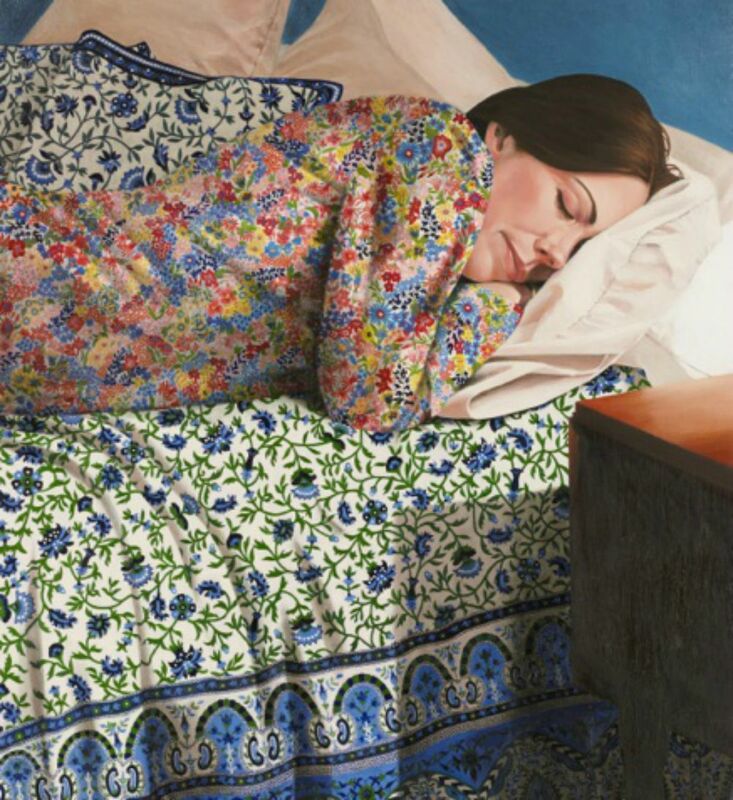 Of two key pieces at the Lodge Gallery, Wedding Day, in which she is portrayed sleeping nestled under plush bedding, and Before I Could Answer, a six-foot by seven-foot self-portrait of herself in a turquoise pool, Livingston said "we are most exposed when we feel the most protected." She has placed her viewers as voyeurs: in one instance watching the intimate ambiguity before a life milestone and in the other, a contemplative moment preceding another significant decision. Livingston, who is generally introspective and reserved, said only of the latter: "It represents being out on a limb. "Pools are so brilliantly lit at night that everything around them disappears into black. It lends to that precarious feeling." That general reluctance toward averment has, perhaps, kept Livingston away from the necessary self-promotion required for the coveted New York scene since she earned an MFA in painting at Boston University. But her pursuit of a regular life outside painting - one that many artists eschew -- had also previously kept her from straying too far from the galleries in Boston and New Haven and producing another significant body of work. Not long after settling in Brooklyn and giving birth to her son, however, Livingston felt a twinge in her right hand that required a stroke of a paintbrush. Although she made two self-portraits during her pregnancy -- Waiting, which shows a pregnant Livingston turning out a lamp, and the discordant Hurricane, a meditation on Hurricane Sandy -- she temporarily abandoned the figure painting for her reclusive houses. "I had started seeing the house as a vessel for the family, rather than an isolated figure. But I always seem to go to the opposite side of the ways in which most people think -- how nothing treasured is going to last forever," Livingston said. ""A small country home at dusk with the porch light on reads both as a safe house and as defenseless outpost against the dark woods surrounding it." That Livingston paints the ambiguity about life most people generally gloss over or cast aside could possibly constitute her appeal in a world that grows more and more uncertain. Or as Voegele suggests, "Her scene juxtapositions are rendered impeccably, and our patrons really relate to her experience." Either way, whether building or person, country or city, Livingston doesn't envision ever letting go of the artist's sensibility instilled in her. "I somehow always return to this exploration of the idea that the more 'safe' and protected our lives, the more vulnerable we actually are."